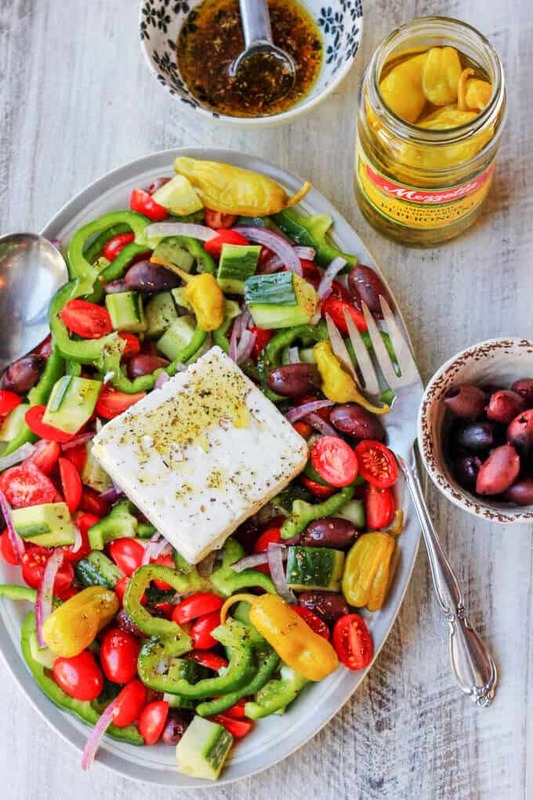 Horiatiki Salad with Golden Greek Peperoncini, combines the freshest ingredients of: seasonal tomatoes, cucumbers, green peppers, red onions, tangy Kalamata olives and creamy feta with a mildly piquant, fruity flavored Mezzetta Peperoncini! Horiatiki Salad, or village salad, is what is known in US as Greek Salad. It is a very humble dish that uses the fresh and simple ingredients. It’s in season from late spring to early fall – when the tomatoes, cucumbers and peppers are at their peak. We’re now at the beginning of August on East Cost of US and the big, meaty tomatoes are just about to ripen up….but they’re not quite there yet. 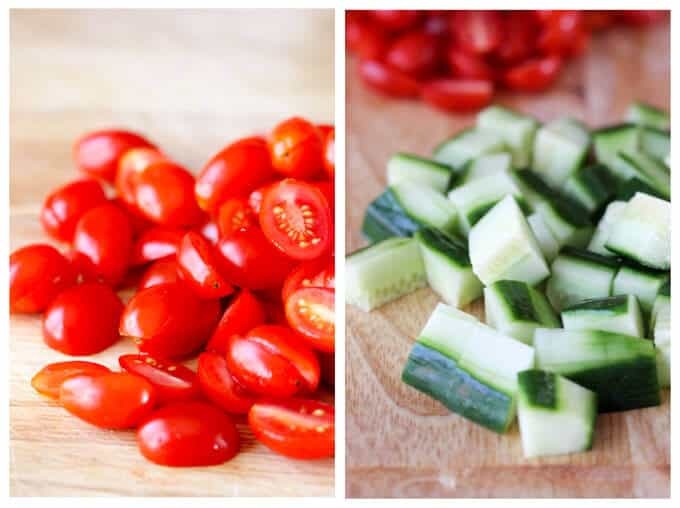 However, the small, cherry tomatoes are taking over my tomato garden and they too are super delicious; that’s why I used them here in this recipe for a Horiatiki Salad. I know, that this Horiatiki Salad should have big tomatoes cut up over the bowl to get all the juices marinating in there, but I am a huge proponent of using whatever is in season. Hence my use of little cherry tomatoes in this recipe. So, fast forward about 2 weeks & I’ll be using my beef steak tomatoes for this amazingly simple salad. To be perfectly clear, a real Greek salad never contains lettuce! Lots of dried oregano (preferably Greek dried oregano)! Even though, this salad is perfect on its own, I decided to spice up every bite with Mezzetta Peperoncini. Grown on sun-drenched Mediterranean farms, the Mezzetta Peperoncini flavors create a eating experience which will awaken your senses. In fact, they can transform even an everyday dish to crave worthy. 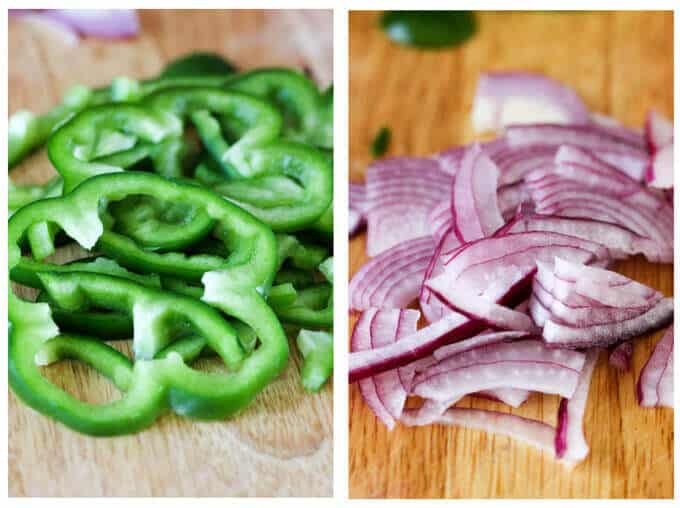 You can add them whole….you can chop them….you can buy them already chopped, and use them whenever you want to energize and brighten up an every day recipe. 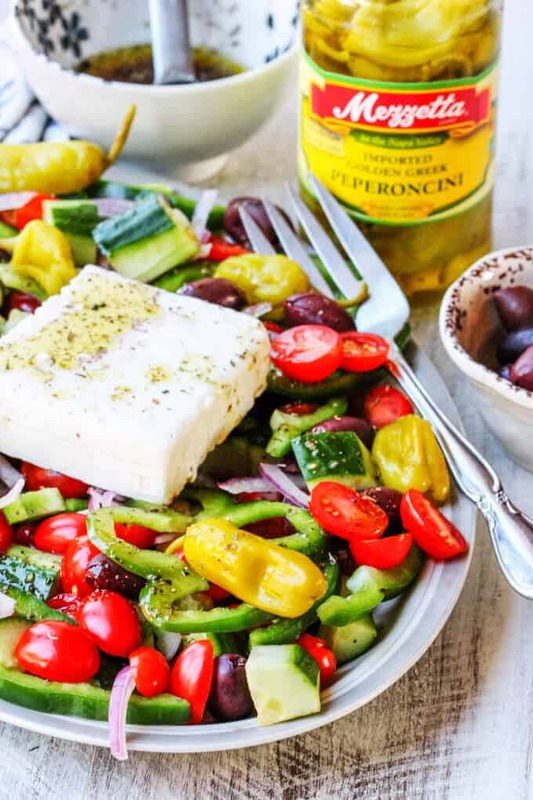 This Horiatiki Salad with Golden Greek Peperoncini just screams summer. And when the tomatoes are at their best you’ll crave this salad with a little peperoncini kick, all the time. I can guarantee that a jar of these Mezzetta Peperoncini will be empty before you even know it. Haven’t you been in a situation when you bough a jar of peppers, used some of them, then forgotten them in a fridge? I’ve been there more than once. However, not with these Golden Greek Peperoncini though. They are just so good – I can just eat them straight from the jar. 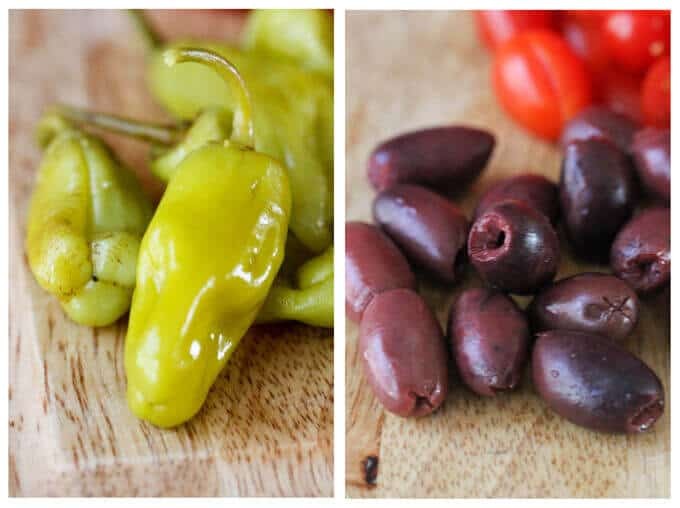 However, you can use these peperoncini in a number of different ways to energize and brighten your meals, adding flavorful contrast and complexity to turn the boring into WOW! Chop them and add to your favorite dip. 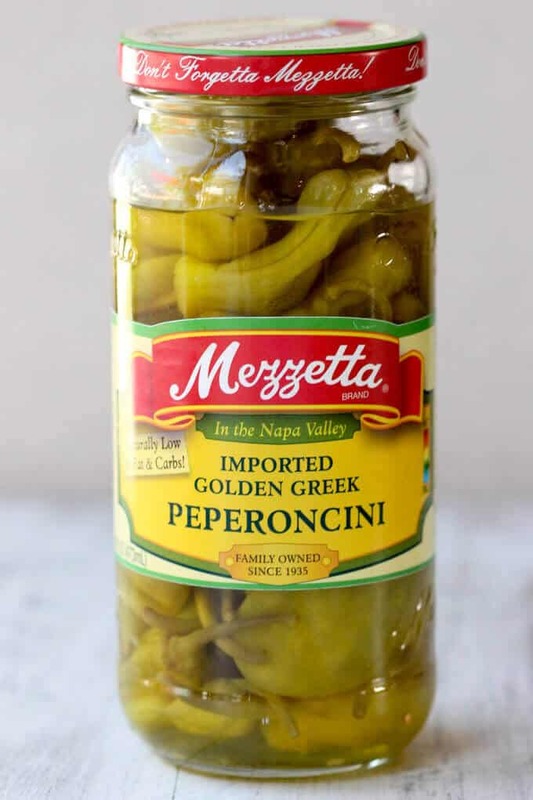 There are so many ways to enjoy this bold, bright flavored of Mezzetta peperoncini! My newest addiction is adding them to my all-time favorite summer salad: Horiatiki Salad. I’ve visited Greek islands on a few occasions in my life, and every time I’ve landed in Greece I wanted to have my Horiatiki Salad immediately. There’s nothing better then fresh vegetables with a super fragrant olive oil, a splash of red wine vinegar and dried oregano. At least that’s what I thought until I went into a Greek Tavern in New York, and they served my favorite Horiatiki Salad with peperoncini too. I was blown away. 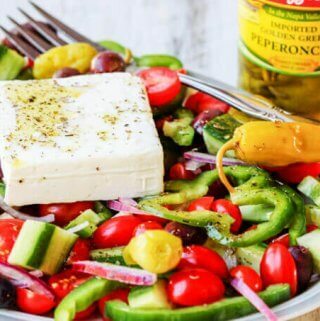 Ever since I’ve always added peperonicini to my Greek Salads, and I have not found fresher, more versatile ones than Mezzetta Golden Greek Peperoncini. 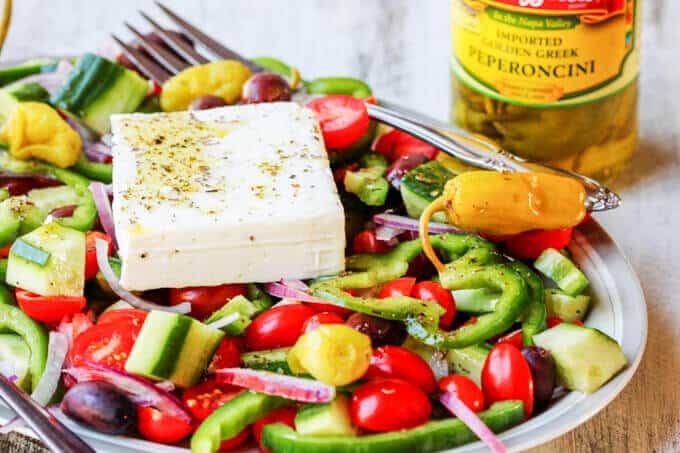 Horiatiki Salad with Golden Greek Peperoncini combines the freshest ingredients of seasonal tomatoes, cucumbers, green peppers, red onions, tangy kalamata olives and creamy feta with mildly piquant, fruity flavor Mezzetta Peperoncini. 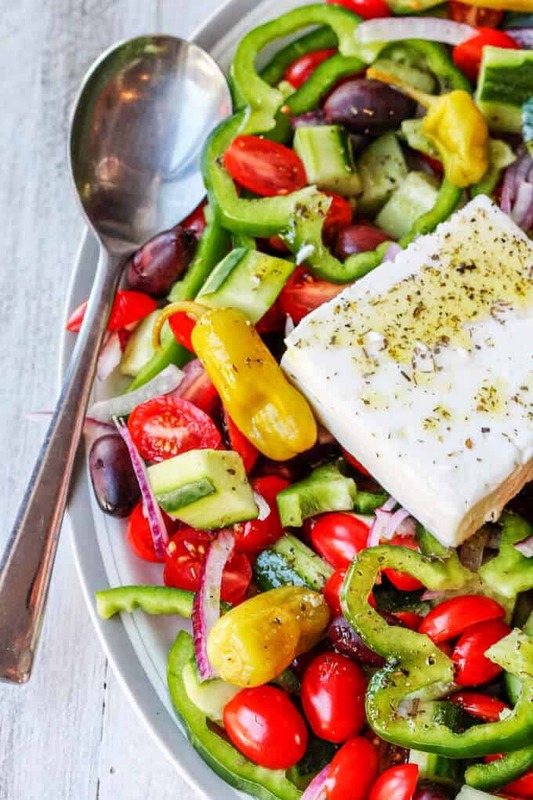 Top salad with a block of feta & serve immediately (or sooner) with a crusty bread. I used whole teaspoon of dried oregano for this dressing as the salad should have a lot of it. If you feel like you may not like that much oregano, start with 1/2 teaspoon. 3. 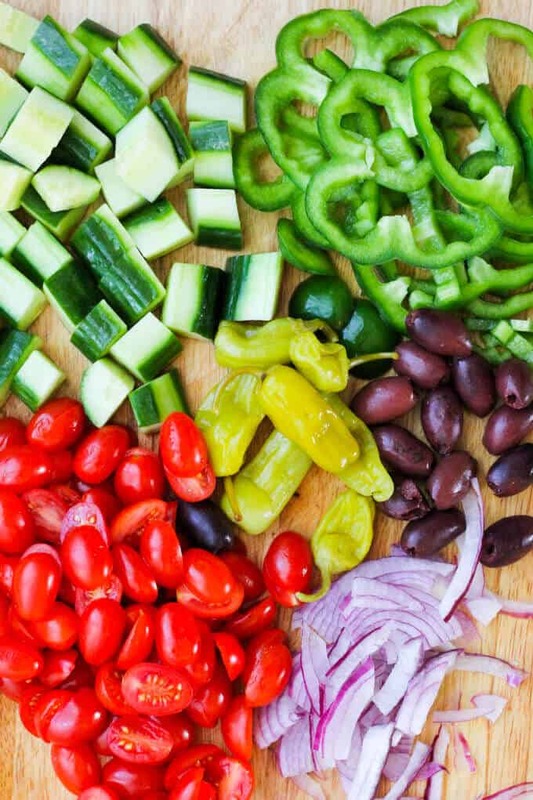 Combine vegetables with olives and peperoncini, then pour over dressing & top with a block of feta…then serve! This sounds right up my street, fresh and delicious. I love kalamata olives and feta cheese, I might just make this for dinner tonight! This salad looks so fresh and delicious! Summer tomatoes are the best! Peperoncini looks like a great addition! Oh my goodness! This salad is gorgeous with so many bright vibrant veggies!! If gobble this up! 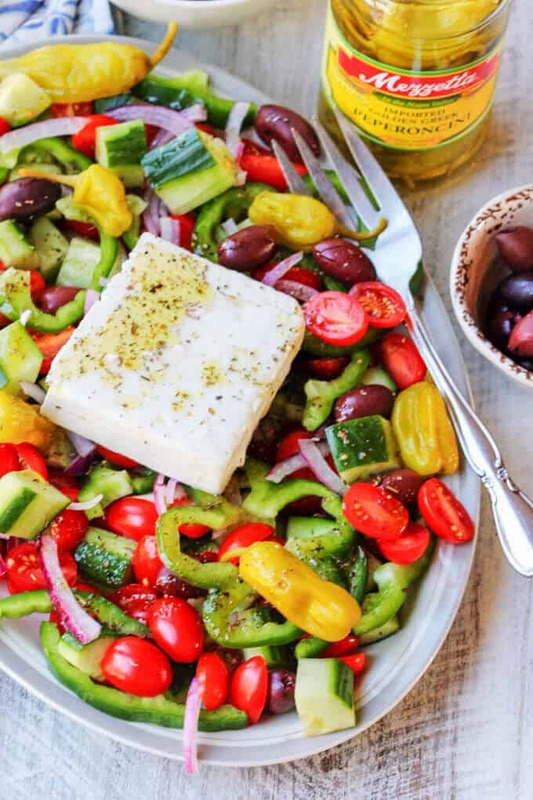 I fell in love with REAl Greek salad when I first visited Greece and you’re right – it is spectacular this time of year. I’ve made it with cherry tomatoes and too and I actually love them in this kind of salad! I am going to have to make this this week now because you’ve given me all of the cravings! This is my kind of salad. Love all the Mediterranean flavours going on here. Perfect as a side…or hearty enough for a main dish. Entertaining perfect too. That looks like a delicious, colorful and a hearty salad! This salad looks absolutely delicious and makes so hungry! I love your pictures because they bring out the vibrant colours of the vegetables. Sounds very tasty! I love peppercinis! I probably spelled that wrong , LOL! Thank you for sharing this recipe! This looks super yummy! I am never very inventive with my salads…we get so little good weather over here that salads are rarely on the menu, other than a quick side salad! rooh! Yummy! this look so delicious!! I love the vibrant and bright colors of the vegetables! I love trying new salad recipes and I’ll definitely do this one. I fell in love with Peperoni. I will try it later and I’m sure my love ones would definitely like this. Thanks for sharing!! Love all the veggies they are so colorful and bright. I like a fun salad, you can make for a dinner party. It’s perfect for a dinner party. Thanks for stopping by Kristal! This looks amazing! I’d love to try it.